Digital Photos « Believe-In-Rollins.com | Your Most Dedicated Source for Seth Rollins! In the opening moments of Raw, Roman Reigns emerged to announce that he had been living with leukemia for 11 years and the disease’s return would force him to relinquish the Universal Championship and take a leave of absence from WWE. How do you properly honor Roman Reigns as he takes his leave of absence to battle leukemia? According to Dean Ambrose & Seth Rollins, there is only one option: To win. Competing under the name of The Shield, they did just that and won one for Reigns — and then, Ambrose went into business for himself. Yes, The Lunatic Fringe finally snapped after weeks of in-house tension among The Hounds of Justice, unloading a torrent of fists on The Kingslayer after the two brothers in black dethroned Dolph Ziggler & Drew McIntyre to become Raw Tag Team Champions. They got that win thanks in no small part to an assist from Braun Strowman, who came seeking vengeance against Drew McIntyre and took The Scottish Psychopath out of the match by brawling with him through the crowd, leaving Ziggler ripe for a Stomp that sealed the match. What was shaping up to be an emotional celebration in Reigns’ name, however, turned into Ambrose’s moment in a horrifying hurry. The Lunatic Fringe dropped Rollins with Dirty Deeds and slowly and methodically beat his fellow champion around and outside the ring before finally administering a second Dirty Deeds on the exposed concrete of the arena, ditching his black shirt and walking up through the crowd they had come through. 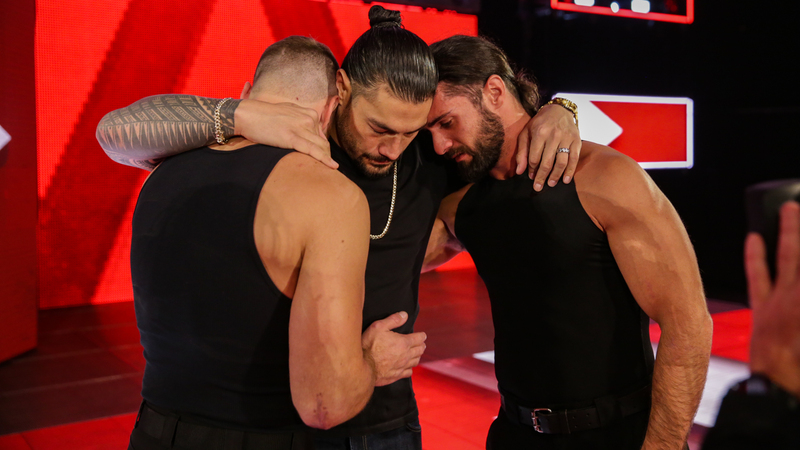 On a night when Roman Reigns made an incredible sacrifice as a Raw Superstar, his brothers had seemingly pulled out all the stops to honor him. Now, Reigns has left. Ambrose has come undone. Those are the facts. Beyond that, it’s difficult to say what anybody should believe. So, what’s the deal with Dean Ambrose and The Shield? After much speculation about whether The Lunatic Fringe would turn on The Hounds of Justice last week, the former WWE Champion opened Raw with an interview with Charly Caruso meant to address the lingering questions of The Lunatic’s loyalty. 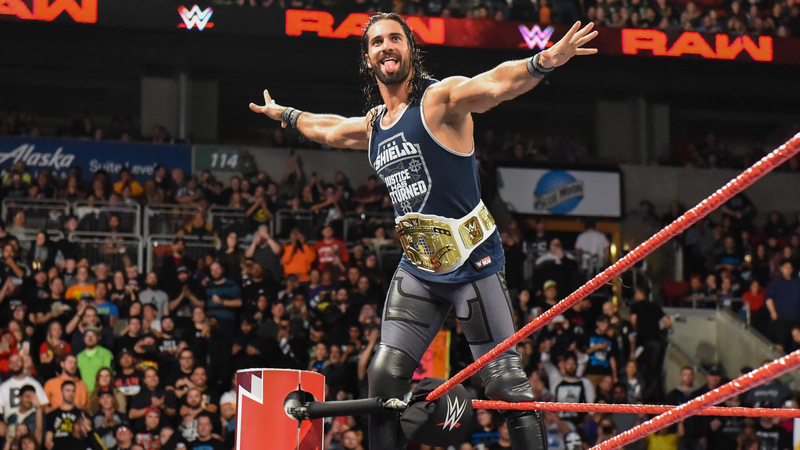 However, the former WWE Champion refused to allow himself to be pinned down: Even though he acknowledged the “truth” of what Braun Strowman, Dolph Ziggler & Drew McIntyre said about him and cryptically (and maybe sarcastically) hinted that if he was going to turn on Seth Rollins and Roman Reigns, he’d probably wait until everybody least expected it, Ambrose ultimately declared he’d rather be judged by his actions rather than the speculation of the WWE Universe. He closed the interview by confirming The Shield would be a united front heading into WWE Super Show-Down on Saturday, but at least one Superstar wasn’t buying it. Acting General Manager Baron Corbin, still smarting from his loss last week, gave Ambrose a chance to show where he really stood by choosing one of three options for his match on Raw: A Universal Championship Match against Reigns, an Intercontinental Championship Match with Rollins, or a one-on-one match with Strowman. When Ambrose tried to turn it around and finagle a match with Corbin, The Lone Wolf made the decision for The Lunatic Fringe, placing him in an immediate match with Strowman instead. Could Dean Ambrose beat Braun Strowman? He certainly came close when he planted The Monster Among Men with a surprise Dirty Deeds after a long, grueling bout that was going Strowman’s way until The Lunatic Fringe up and dropped his foe with the double-arm DDT that once won Ambrose the WWE Championship. But it wasn’t enough: Strowman kicked out of the pinfall, rolled out of the ring and (despite a frantic follow-up from Ambrose) quickly turned the proceedings from a match into a statement beating — one so severe Roman Reigns appeared to run interference, clocking Stroman with a Superman Punch that led to a disqualification win for The Monster Among Men. 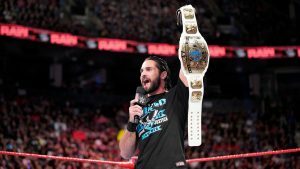 It also set up the evening’s next match: After Seth Rollins joined the fight and Dolph Ziggler & Drew McIntyre arrived to even the odds, Baron Corbin re-emerged to restore order by immediately sanctioning Reigns vs. Ziggler, as well as Rollins vs. McIntyre for later in the evening. As for Ambrose, he wasn’t crazy about the whole thing. In fact, when Rollins went to check on his brother in the trainer’s room, The Lunatic Fringe pointedly reminded The Kingslayer that he could have left Raw as Intercontinental Champion if he made a different choice. Braun Strowman made it clear before Drew McIntyre battled Seth Rollins that he would not accept a weak link in his squad as WWE Super Show-Down approaches. His pointed stare at Dolph Ziggler did not go unnoticed, nor did McIntyre’s failure to defend his fellow Raw Tag Team Champion — which is probably why The Showoff made his presence known in the waning moments of McIntyre vs. Rollins, dashing into the ring to administer a pre-Stomp distraction that freed up McIntyre to blast Seth with the Claymore for the win. All hell broke loose quickly after the match, however, as Roman Reigns, Strowman and finally Dean Ambrose — axe handle in hand — threw hands in a chaotic six-way brawl. Ziggler was a key figure in the fray as well, administering the Zig Zag to Reigns and assisting with the Claymore-Zig Zag combo on Ambrose. Strowman got the last word with a Running Powerslam to Reigns, and the “pack” ended their evening with a Shield-style fist bump of their own. If there is a weak link to be found, it’s hard to see. Last week, Braun Strowman, Dolph Ziggler & Drew McIntyre got themselves a bunch of new friends last week when half the Raw Superstars helped them lay out The Shield. That said, it doesn’t seem from Raw’s opening moments like that alliance was anything more than a partnership of convenience. After thanking the Superstars who had made what Ziggler called the “hard choice” of standing up to The Shield, Strowman & Co. found their backup all but evaporated after The Hounds of Justice came down through the audience, axe handles in tow, and tried to fight their way to Braun and his “dogs of war.” Rather than throw down on even footing, however, Strowman, Ziggler & McIntyre opted to head for higher ground. 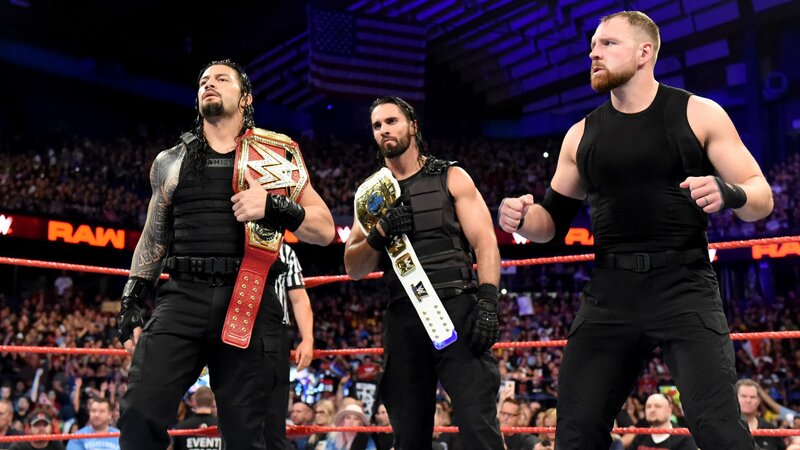 Once again, however, The Shield found themselves in a standoff with the law, as local police officers cornered The Hounds of Justice backstage. Rather than have them hauled off to prison a second time, however, Acting General Manager Baron Corbin offered them an ultimatum: The Shield must vacate the premises, or Roman Reigns and Seth Rollins would forfeit the Universal and Intercontinental Championships and all three would go to jail for a “long, long time.” The Shield can call this skirmish a victory, but clearly, the bigger battle isn’t quite being dictated on their terms just yet. With their win over The B-Team, Dolph Ziggler & Drew McIntyre cleared the decks of competition and cemented themselves as the kings of Raw’s Tag Team division, but they might find that it’s harder to hold the throne down than it was to take it. Even though the champs held off an effort by The B-Team that was so gritty and inspired that they had to resort to chicanery — McIntyre dispatched Curtis Axel with a Glasgow Kiss, and Ziggler raked Bo Dallas’ eyes — to set up the Claymore-Zig Zag combo, they didn’t get to enjoy the fruits of their labor: Dean Ambrose & Seth Rollins jumped the titleholders from behind immediately after the match and sent them scurrying. Acting General Manager Baron Corbin was furious that his edict had been defied and The Shield had returned, but Rollins & Ambrose pointed out that they were acting on their own, and The Shield had technically kept to their word and stayed away. They also seemed to get Corbin to kind of-sort of admit he had them arrested last week, bringing out a Deputy Sheriff (“G. Ambrose,” according to his uniform) to take The Lone Wolf into custody. However, after a quick sidebar, Rollins & Ambrose opted not to press charges and Corbin later ruled that Ziggler & McIntyre would defend their titles against Ambrose & Rollins at the WWE Hell in a Cell pay-per-view. His reason? That Raw Commissioner Stephanie McMahon wanted Sunday’s event to have as many big matches as possible. It’s been a terrible, horrible, no-good, very bad summer for Kevin Owens, but it appears the former Universal Champion’s woes may be over. Not because he made good on his promise to leave Toronto with a title, mind you, but because KO’s fiercely contested bid for the Intercontinental Championship ended in a loss that left him so demoralized he up and quit on the spot. 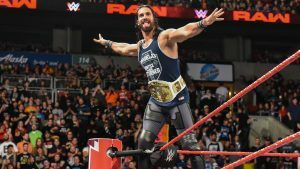 The match came about in the first place because Seth Rollins had reinstituted his Intercontinental Title Open Challenge policy when it became clear former champion Dolph Ziggler was otherwise occupied. That brought out Owens, who was hungry for redemption after a Raw return that has not gone quite as he’d hoped. He gave a great fight, too, brutalizing The Architect’s arm and forcing him to fly on a clipped wing. When an agonizing submission and surprise Stunner failed to get the job done, however, KO got desperate with a last-ditch moonsault. Rollins dodged, hit the Stomp, and that was that. Last week, Braun Strowman felt the wrath of The Shield. This week, he got even. During a main event that saw The Monster Among Men team with Universal Champion Roman Reigns against Dolph Ziggler & Drew McIntyre, Strowman accepted a crucial tag from a battered Reigns but refused to enter the ring. Instead, The Gift of Destruction gave The Showoff and The Scottish Psychopath free reign to decimate The Big Dog, ending the bout in a disqualification and opening the door for Strowman to exact his payback. The extended three-on-one beatdown of Reigns first brought out Dean Ambrose and eventually the one-armed Seth Rollins, but the two other Hounds of Justice were no match for the makeshift trio. The Lunatic Fringe suffered the Claymore-Zig Zag combo, Rollins caught a Zig Zag of his own, and all three were subjected to Running Powerslams from The Monster Among Men. Ziggler & McIntyre couldn’t have been more right when they opined that Strowman and Reigns couldn’t get along as partners and that they were teaming only as a matter of pride. What they didn’t realize was how far that pride would motivate Braun Strowman to go.